Photomontage was added as a category for Challenger’s Choice during the 4th week of the month. Panorama was added as a category for Challenger’s Choice during the 4th week of the month. After much deliberation with participants and readers of this photography challenge, a new title was launched: Sally D’s Mobile Photography Challenge. Guidelines to enter remain the same, which include a different theme each Monday of the month. The challenge pushes our creative energy and experimentation. Please join the fun. Happy mobile photo challenge. After much deliberation with the challenge’s photo community, a new title (the third change: scroll down to read more) was selected for the challenge. It reflects the evergreen quality of photography with its bountiful possibilities for image making. For the new badge to be placed on your homepage, you one of these URLs: http://imagizer.imageshack.us/v2/320x240q90/844/x7dj.png/smaller version or http://imagizer.imageshack.us/v2/640x480q90/713/irgh.png/medium version. To celebrate the first-year anniversary of the challenge, a few changes were made. Below you can view additions, which are in bold. The schedule shows themes used for each weekly challenge of the month. 5th Monday: Editing and Processing with Various Apps Using Themes from the Fourth Week (31 March 2014 will be the first challenge for this new theme). Since the birth of the iPhone in 2007 and thereafter the mobile photography movement, using a Smartphone as a camera has become part of our everyday culture. In early 2013 this weekly challenge was launched to celebrate a phenomenon that has burst its seams. Today the photographic tool kit has another piece of equipment: the cellphone, which makes shooting the unexpected more possible. 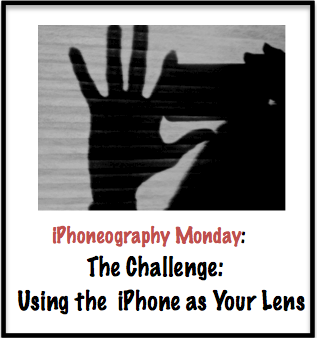 Those who use their phones to capture visual moments are welcome to join the challenge. One of the benefits is participating in the building of a broader and wider Phoneography and Photography network. Personal enrichment is one of the major goals, because this opportunity is meant to encourage our most creative and innovative selves. Happy shooting. 1. Each Monday a theme will be posted. You can publish your entry at any time, preferably on Monday or by Sunday of the week of the theme. Please add any information about the entry (apps, brand of phone…). 2. To increase chances others will find your post, use “tags” such as iPhoneography, Phoneography, Post a Week, photo challenge, Photography, Post a Week, Mobile Photography, or the week’s theme. Also you can use comments, Pingbacks, and social media to spread the word. When you leave a comment on someone else’s challenge post, provide a link back to your blog. Then others can view your entry. 3. To receive a reminder post on Monday mornings, Follow or subscribe to sponsors at Sally’s blog (https://lensandpensbysally.wordpress.com) and Polly’s blog (http://Watchingthephotoreels.com). When you post your entry, we encourage you to provide a link back to one of our blogs where the rules can be reviewed. You can view links to other participants’ entries on Sally’s blog at https://lensandpensbysally.wordpress.com). 5. Each Monday view sponsors’ posts for additional information about Phoneography: innovations in the field, apps, equipment, rising stars, printed books, e-books, tutorials, and other resources. Read the Tip of the Week on Sally’s blog at https://lensandpensbysally.wordpress.com). Mobile Phoneography allows us instantly to capture the fleeting moment. This technology has reinvented photography, creating the best of all possible worlds, where we always have a camera with us. Please join the fun and use the Phone as Your Lens. Because the mobile photography movement has burst its seams, the challenge was launched early 2013 to celebrate its popularity—the popularity of the Smartphone as part of the photographic tool kit. Anyone who uses a phone to capture their world is welcome to join the fun. Below you can read about how it works. Simply substitute Phoneography for iPhoneography. Please use the current badge until a new one is created. Happy shooting. The iPhoneography Challenge began on 04 February 2013. Please join Gracie, Polly and Sally, as we move forward with this project. Here are our links: http://graciebinoya.com and http://watchingthephotoreels.com and me, which is where you are. Here is our logo, which we hope you will post on your sidebar, and become a participate as we build a new community of iPhoneographers. 1. Each Monday a theme will be posted. You can publish your entry at any time, preferably between Monday through Sunday of the week of the theme. Please add any information about the entry or iPhoneography (apps, editing…) on your post. The challenge is meant to inform, learn, share and build a wider iPhoneography and photography network through participation and readership. 2. To increase chances others will find your post, use “tags” such as iPhone Challenge, iPhoneography Monday, Post a Week, iPhoneography Challenge, Using the iPhone as Your Lens, Photography, Digital Photography, Inspiration, or the week’s theme. Beside tags you can use comments, Pingbacks, links, and social media to spread the word. When you leave a comment on someone else’s challenge post, provide a link back to your blog. Then others can check your entry. 3. To receive a reminder post on Monday mornings, subscribe to sponsors’ blogs at https://lensandpensbysally.wordpress.com and http://graciebinoya.com and http://Watchingthephotoreels.com. You can subscribe through e-mail on each of our blogs or press the Follow button on the upper left toolbar. When you post your entry, we encourage you to provide a link back to one of our blogs where the rules can be reviewed. Also on the sponsors’ sites you can view links to blogs of other participants. 5. Each Monday view entries of the sponsors who will include additional information about iPhoneography: innovations in the field, apps, equipment, rising stars, printed books, e-books, tutorials, and other resources. Gracie, Polly and Sally welcome ideas or suggestions. This challenge is for personal enrichment, and is meant to encourage our most innovative selves. The iPhone is a source for that purpose and much more. Think iPhone 6,7,8. In the future there will be twists and turns such as Readers’ Choice Exhibitions or Guest iPhoneographers. Join the fun. Pick up your iPhone. Let the iPhone be your lens. Marsha, I appreciate your listing the challenge. Also, thanks for your response to it. Flipboard is definitely worth perusing its photography sections, which includes informative articles. Smartphones, as you know, have altered the way that images are perceived and taken. Thanks again and happy 2017. I do. But it will take my a bit to find it. Really, Flipboard is intuitive. You can select the sections that appeal to you. I only do about 10. They list all the sections, and you select the ones of interest. Hopefully, you’ll find it easy to navigate. Once you make your selection, they’re available daily to you. Thanks for listing my challenge. I’m humbled by the nomination. Thank you. Hi, Sally I am not sure how to get linked in with all the other entries. I have posted for this weeks challenge. You can paste your link (e.g., https://claresphotospace.wordpress.com/2015/02/23/mode-mannequins/) in the comment section just as you’ll see others do. But once I have posted it, I delete it unless there are comments about my post with the link. Delighted to have you as part of the fun. Hi, being a “newbie” I am have a little trouble trying to join & then I need to learn how to fix the widget & how to post my pictures here. So how do I start? Welcome, delighted that that you want to join the fun. I will try to explain. Once you have uploaded your post, you need to send me a Pingback. Type my URL: Lensandpensbysally.wordpress.com into your post (check other examples on other entries), and copy the address and link through the Dashboard. You can also make a comment on my Monday post with your URL address for that day’s post. To get the widget on your blog is always problematic. Go into Appearance and find the widget section and drag it to your sidebar. It will give you prompts. All of these things take doing them. Often if I have problems, I raise the question in my search engine and someone will respond with an answer. If my advice doesn’t help, you might ask someone else who has an entry to explain how they got the widget posted. Hope that this explanation helps. Hope to see you next week for the Nature challenge. Welcome. I’m delighted to have you join us. You organized a great list of photography challenges. 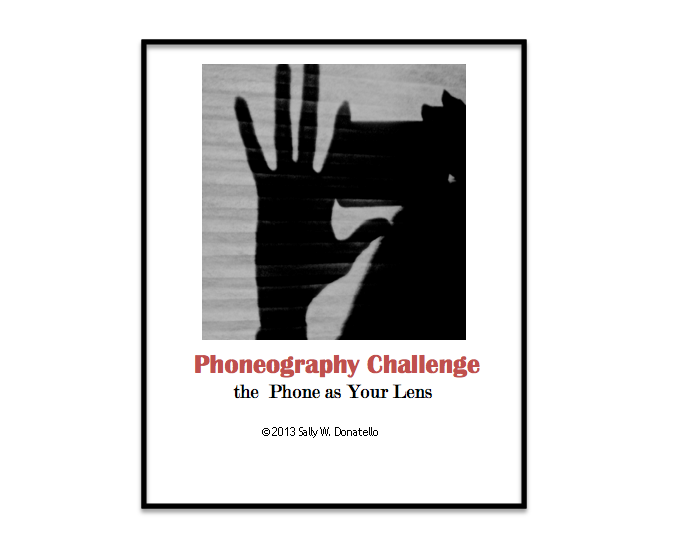 Thanks for including the Phoneography Challenge, which runs every Monday. Thanks so much for the Pingback. Jann, welcome. It’s grand to have you join the community. I’m off to see your post. Thanks for your comment and visit. Irene, your recognition of the photo challenge is a humbling experience. I’m grateful and appreciative. I’m on holiday. Will not be back to my blogging life until next Wednesday. See you then. Cassie, I’m on holiday. WiFi is iffy. Will be back next week. Thanks for the visit. I’ll stroll over to your blog for a peek. Deb, thanks for agreeing to my conditions. I appreciate your interest in my work as well as your comments. Thank you. I appreciate that you are asking for my permission. That image shows geraniums leaves with the seeds. You may use it as long as you give me credit (Sally W. Donatello) with a copyright symbol (You can use 2014 as the copyright year) and also mention my blog: Lensandpensbysally.wordpress.com/ You have to use the image as it is, and not alter it in any way. I would also like for you to send me a message with the post URL, and I can see how you used the image. If these conditions are acceptable, let me know. 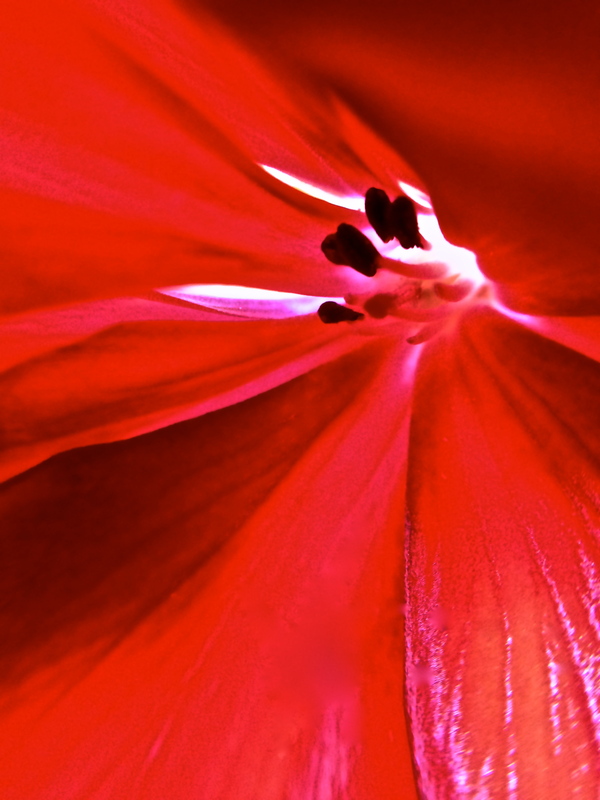 Hi Sally, I discovered your wondrous photograph of the red (gladioli?) flower with seeds and wondered if I may use it? It would be part of a blog about keeping your eyes in (and tending) your own garden. Is there a place I may purchase this? Or am I able to simply use it with your permission? I would love to know. What a great space you have here – very inspirational. First, thank you for contacting me and asking my permission to use the image. Yes, you can purchase the image. Alternatively, I can give you permission to use it, but you must give me credit and link to my blog’s Hpmepage. If you decide to post with my permission, please send me the link to that post. Once again thank you for doing the right thing. Got it – thank you – I see you have been able to read my comment, my article has evolved slightly. I will credit you and and link and also send you the link to my post. Thank you so very much. Now I need to go find the picture. Your site is simply amazing. It seems that you got my first response. I just sent another. I added that you cannot alter the image in any way. Please agree to that condition too. My phone is a Samsung, not an iPhone, is that OK? Do you have a logo that is for smartphone in general? The one you showed above is for the iPhone challenge. I love photo challenges! Welcome, yes, all Smartphones are part of the challenge. Would be delighted to have you join the fun. Go to this post (https://lensandpensbysally.wordpress.com/iphoneography-challenge/) and you’ll find the latest badge. Hope to see you soon. Thanks. Oh, maybe someday. See you soon. Thanks. I just stumbled on to this site by way of another blogger’s link (http://uniquesochic.com). I’m so glad I did! I always take pictures with my iPhone and love the opportunity to partake in another weekly challenge post. Looking forward in seeing and reading other people’s posts. Please do join the fun. Monday is a celebration of nature–hope to see you. Thanks. I am so delighted to have you part of the challenge. I am trying. Mums the word eh? How’d you do it please ? It’s wonderful ! The best advice that I can give is: good lighting, don’t get too close where blur occurs (unless you want that effect), trying different angles, stabilizing the phone, and mostly PATIENCE. I appreciate your comment. Thanks. You Blog is just wonderful Sally. I try to keep up! I’m humbled. I’ll be happy to have you visit any time. I love the red photo displayed here! Welcome to the Phoneography Challenge. Hi! I’m really excited about posting my photo’s for the challenge but I am not quite sure exactly where/how I should go about it. Can I just post a link here in the comments? Is it still the architecture challenge? Thank you! Welcome, we’re delighted. Yes, if you send me your link, then I will list it on my post. While most people post on the day of the challenge, others will post any day before the next Monday. On my Homepage and under the masthead photograph, you’ll find a title for the challenge. Click on it and read the information. When you have posted your image, simply send me a message with the link or send a Pingback. But do send it on the post for that week (this week’s challenger’s choice: architecture). Again happy to have you join the fun. Thanks for the Pingback. Happy Phoneography Monday. Thanks for the Pingback, and happy Phoneography Challenge. Happy Phoneography Challenge–we had a re-launch today. My best advice is to get Flipboard as an app–I’m pretty sure that it is free. Each night I peruse the iPhoneography for the artists, their work and the apps that they use. It’s quite informative. The visual range is astonishing. Mostly, it’s the doing. Every image that you take teaches you something about how you see the world and record it. Please contact me any time. Also buy an app or two and experiment. Yes, will await your work. Happy iPhoneography Challenge and Macro theme. Happy iPhoneography Challenge and another salute to nature. I’m not sure where to post pingbacks for thd Monday challenge, so I will start here. That’s fine. The Pingback is the usual way, i.e., on my post for the challenge. Then I can visit your blog, and post your URL on my current post. Welcome, and thanks for the Pingback. Happy iPhoneography Challenge,and thanks for the Pingback. Thanks for the Pingback and happy iPhoneography Challenge. Happy iPhoneography Challenge, and welcome. This is great! I look forward to participating in the challenges-I am continually amazed at what the iPhone is capable of-Thank you! My pleasure, and do join the fun. Just discovered this photo challenge via Ohm Sweet Ohm. 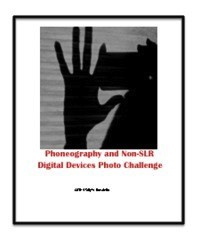 I look forward to trying my hand at the iphoneography challenge. Please do join the fun. Thank you. Glad that you decided to join us. I don’t have an iPhone, but I passed the link to a few that do … Wonderful idea. Good luck with it. That’s great. We’re trying to build participation, and your kindness helps to inform others. Thanks so much. Thanks for the Pingback. Do check the categories for each Monday. Great to have you in the challenge. I’m in! Great idea. I use my iPhone 4s quite a bit for photography. Thanks for the link to Flipboard. Terrific, welcome to the challenge. Flipboard is definitely a source for iPhoneographers.